This is Montana. This is fly fishing. It’s a special feeling. Rising before dawn, knowing that as the sun peeks over the mountains you’ll be on the Missouri River. Casting tiny dry flies to pods of rising fish — the likes of which you’ve never seen. At Wolf Creek Angler we know that feeling – it’s what brought us here. 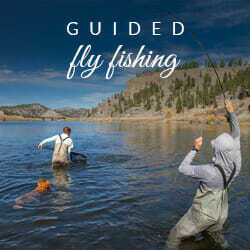 As a result we share your passion for fly fishing. We are ready to deliver the ultimate fly-fishing adventure on the famed Missouri River as well as the other world-class waters of Montana. 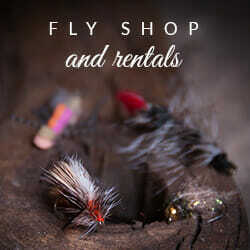 Having a fly shop located just off Interstate 15 in the historic town of Wolf Creek, Montana, just minutes from the Holter Dam and Wolf Creek Bridge access sites, makes fly fishing on the Missouri River even better. We have one of the largest selections of fly patterns on the Missouri River. At Wolf Creek Angler, we pride ourselves on having the hardest-working guides you will find anywhere in Montana. Our guides have spent their entire careers fishing the Missouri and other legendary waters of the West. Whether you are a beginner or a seasoned angler, a great fishing adventure on one of our guided tours is a can’t-miss experience. 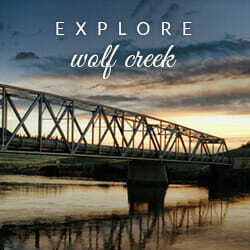 The historic town of Wolf Creek, Montana, is tucked in the heart of the Big Belt Mountains and has everything you need in a classic, small-town Montana setting. Read more about all that our area has to offer here. We have plenty of lodging options to make your stay in our area all the better. 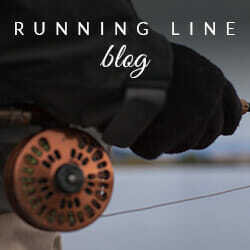 Don’t forget to check out our blog, The Running Line. Wolf Creek Angler’s blog is updated frequently by our owner Jason Orzechowski. Here you’ll find information about all things Montana and fishing, including reports and local happenings. Interested in a Missouri River fly fishing trip? Call us at 406.235.4350.